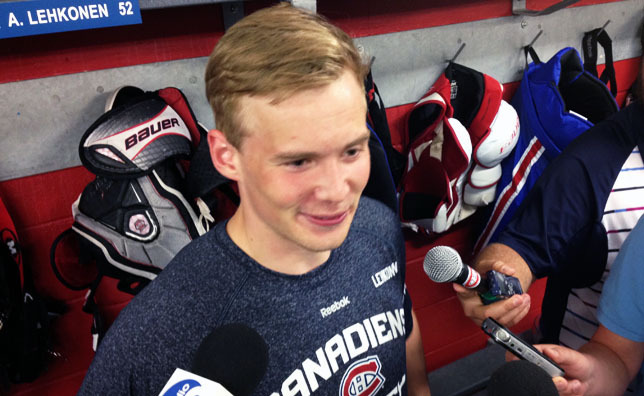 BROSSARD – If Artturi Lehkonen is all smiles these days at the Bell Sports Complex, there’s a good reason why. Unlike the past two years, when Lehkonen was unable to hit the ice at Development Camp due to injury and illness, the 20-year-old finally has the good fortune of being in perfect health. Over the past three days, Lehkonen has participated in on-ice activities alongside 42 other prospects and invitees on the South Shore, something he simply couldn’t do since being selected in the second round, 55th overall by the Canadiens back in 2013. It should come as no surprise that Lehkonen’s focus these days is squarely on showcasing his scoring touch. Coming off a tough debut season with the Frölunda Indians in the Swedish Hockey League, the 6’0”, 174-pound left-winger is eager to demonstrate that ability to light the lamp first-hand, beginning with a strong showing on the South Shore. “Of course I put a lot of expectations on myself in Sweden. I had a really tough beginning of the season and then I was going up and down, but towards the end of the season, I played really well. I got back into a rhythm and I scored goals. I found the rhythm again, I think,” mentioned Lehknonen, who put up eight goals and 16 points in 47 games in 2014-15 after making the move from Finland’s Liiga to the SHL on a two-year contract. Fortunately, Lehkonen is already quite familiar with North American rinks, including those in La Belle Province. Having donned his nation’s colors most recently at the 2015 World Junior Hockey Championship in Montreal and Toronto last December, the Piikkiö native is feeling right at home in his surroundings. Lehkonen didn’t let the disappointment of coming up short in Canada affect his play down the stretch overseas, though. That certainly caught the eye of the Canadiens’ director of player development, Martin Lapointe, who is pleased to see the talented forward back in good form. That’s exactly how Lehkonen is approaching things this time around, too.